Roughly 85 students showed up to the University of Manitoba Student’s Union’s (UMSU) annual general meeting (AGM) March 28 to raise concerns about the state of the union. The union took flak over the time and date of the AGM, which some allege was calculated to avoid tough questions surrounding president Jeremiah Kopp’s allegedly inappropriate union credit card spending. The reports and questions for Kopp took up a majority of the meeting, extending for over an hour. Kopp has been under fire ever since an UMSU council meeting several weeks ago where former vice-president student services Jessica Morrison alleged that he had inappropriately spent $14,000 on an UMSU credit card. Kopp expressed disappointment at the AGM that most questions directed towards him were regarding the release of his UMSU credit card statements, noting that the projects and campaigns successfully conducted by UMSU throughout the year were being overshadowed. “I do wish people looked at the fee levies we implemented that will help indigenous students from vulnerable circumstances, undergraduate research, funding for child care spots, and renovations to the heart of our campus. But at the same time I am always happy to answer any and all questions about the union,” Kopp told the Manitoban. UMSU council has since formally apologized to the student body, in part for denigrating council members’ reputations after the credit card issue surfaced. The council also voted to cancel a planned forensic audit into the union’s expenses. Another concern raised was UMSU’s recent condemnation of the Canadian Federation of Students-Manitoba (CFS-MB) for partisan activity. 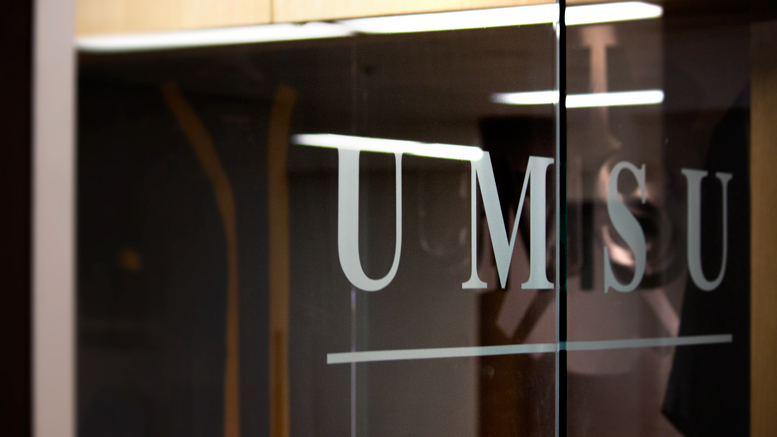 At the last UMSU council meeting, councillors voted to denounce CFS-MB for publicly endorsing the policies of the Manitoba NDP during the ongoing provincial election. At the AGM, Faculty of Music Students’ Association (FMSA) jazz studies representative Anatol Rennie called on the UMSU executives to refrain from publicly endorsing or campaigning for any political party in order to avoid hypocrisy given their stance on CFS-MB. Rennie said if UMSU executives cannot promise to do this or view it to be unacceptable, then they should rescind the motion condemning CFS-MB and apologize. Because the AGM failed to meet quorum of 200 members, Rennie’s motion will be forwarded to UMSU council for consideration at their next meeting. Rennie told the Manitoban that UMSU’s denunciation of CFS-MB misrepresented the issue because CFS-MB did not formally endorse any political party. He added that there was a lack of debate on the motion before it passed in council. “This is the CFS’s job: to evaluate policy and advocate on behalf of students,” Rennie told the Manitoban. Rennie also noted that the original motion was harmful for the already strained relationship between UMSU and CFS-MB. “There’s been a lot of bad blood between UMSU and the CFS,” Rennie said. Rennie also expressed concern that the original motion to denounce was brought forward by Darius Hunter, a council member who worked as a staffer for the provincial Progressive Conservatives, noting that the decision to bring forward the motion could have also been politically motivated. Some students expressed concern over the fact that many of them would never have known about the AGM if an unofficial Facebook event had not been shared during the weekend ahead of the meeting. The meeting was held on the Fort Garry campus at 9 a.m. on Easter Monday, at a time that spans at least two class periods. The AGM drew a crowd of about 85 people, which was noted to be a much higher turnout than previous years. Kieran Labossière, senior stick of the FMSA, created the event in order to encourage students to attend. “Even students who are engaged did not know when or where the event was because UMSU, beyond sending an email with the information and using their Facebook page to make an announcement, provided really no promotion for the event,” Labossière said. Kopp claims the UMSU executive promoted the AGM adequately, pointing out that students were invited via their email, it was put up on the UMSU Facebook page, and discussed at the union’s governance meeting. “Some people are skeptical of everything. The reality is that it was a logistical consideration. There’s only so many places on campus that fit 200 people, and whether you have it at 9 a.m. or 5 p.m. or 10 p.m., people are going to have things on the go,” he said.